Seeing as today is Earth Day - a global event to raise awareness of ecological issues that takes place on 22 April each year - I thought I'd talk about my bluebells. That might sound a pretty trivial gardening question rather than a serious environmental concern, but in fact my bluebells are part of a big problem. 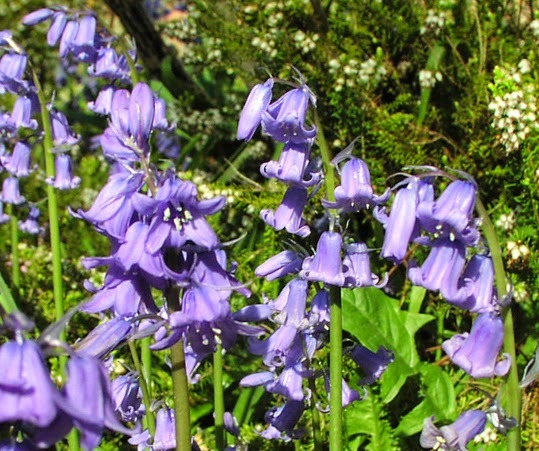 In England there are two species of bluebell - native, British bluebells and non-native Spanish bluebells. Cross-breeding between the two means British bluebells are dying out. Bluebells have grown in my garden ever since I was a child, and I am pretty sure that at one time they were the nice, native type. Over the years, I guess they have become hybridised. Looking at that list you can see that mine (pictured above) are definitely not entirely English. But what do I do? I could rip them all out of the ground and destroy them, but that would deprive bees of flowers that I can see they love. It would also deprive me of one of my favourite garden flowers - although that should be a small consideration when balanced against the health of the environment. Even if I went out and bought some native bluebell seeds to sow, over a few years I think they would quickly become hybridised again - there are just too many hybrid bluebells already in the urban area in which I live. I will pop out today and buy some bee, bird and butterfly friendly flower seeds to plant as part of my Earth Day action, but they may not be bluebells. And the question remains, should my hybrid bluebells stay or should they go? Vivienne, Thanks - my instinct is to agree with you.